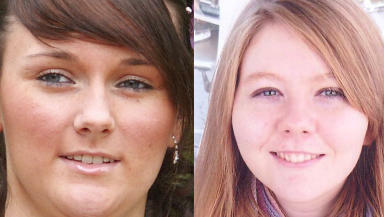 Mhairi Convy, 18, and Laura Stewart, 20, died after being hit by a Range Rover that mounted a busy pavement in Glasgow. The families of two students killed by a 4 x 4 in Glasgow city centre have released photographs of the women. Friends Mhairi Convy, 18, from Lennoxtown, and Laura Stewart, 20, from Cumbernauld, were killed after being hit by a Range Rover that mounted a busy pavement on Friday morning. They were taken to Glasgow Royal Infirmary after the accident, which happened behind the Buchanan Galleries shopping centre and next to the city's main bus station, but were pronounced dead on arrival. The women were students at Glasgow College of Commerce. Strathclyde Police said their investigation into the tragedy is at an early stage but they are working to establish the exact circumstances of the crash. A 36-year-old man was hit just before the two women. He and the 50-year-old male driver of the Range Rover car were taken to the Western Infirmary where they were both said to be in a stable condition. Pedestrians spoke of their horror at witnessing the crash, with one describing how the Range Rover appeared to tear along the pavement. A female GP who was passing the scene stopped to administer first aid and CPR before ambulance teams arrived. Another eyewitness, speaking to STV News, said she saw shoes and bags amongst the debris that was scattered on the road around 30 minutes after the crash. She added: "There were lots of police and several abandoned cars. There didn't seem to be a lot of people around, but people were being interviewed." Police diverted traffic away from the scene of the incident on North Hanover Street at its junction with Killermont Street. Inspector Kenny Welsh is leading the police investigation. He is asking for any witnesses to the crash, or anyone with information that may assist police inquiries, to contact his office on 0141 532 4600.